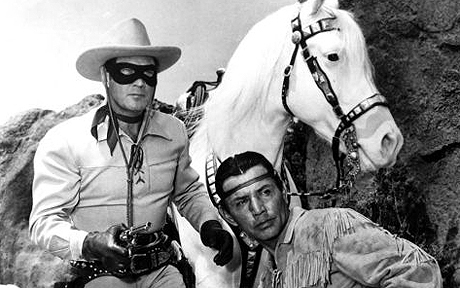 Who Is The Lone Ranger and Tonto? Today is the day, folks! DisneyExaminer will be covering world premiere of this new Disney western comedy…but the story and the characters aren’t that “new.” In fact, they are classics from times past now being brought back for today’s audiences. Through the 1940s to 60s, the story made its way onto television, comic books, and even movies which carried with it a bunch of things (like the theme song from William Tell Overture and the classic “Hi-ho Silver, away!” saying as he rode into the sunset) that would make it a thing of pop culture. It was a classic western story and now more than half a century later, that story will again be told by the storytellers at Disney. With a Hans Zimmer soundtrack, of course. And a westernized Jack Sparrow with a crow on his head. Did any of you know the back story to the Lone Ranger before? Did you watch the old TV shows or read the comics? What interested you the most from the old series? If you’ve never heard the story before, does the back story excite you to see this film? Tell us in the comments! And remember that our coverage of the world premiere of Disney’s “The Lone Ranger” LIVE from Disney California Adventure Park begins TODAY at 3 PM PST! Check out our coverage page HERE. Previous story LIVE from the World Premiere of “The Lone Ranger” at Disney California Adventure Park! Next story Tikis Turn 50.